New STEGO’s filter fans have been added to TME’s offer. Optimum use of space in enclosures containing electrical or electronic components as well as in control and switch cabinets is extremely important. In modern control cabinets there are a lot of devices what consequently leads to a rise in temperature. High temperature inside the enclosure may result in failure or cause damage. Thanks to using state-of-the-art STEGO’s products you can be sure that different types of sensitive components are protected from overheating and failures. Filter fans with PLUS filter are equipped with new gravity flaps designed by STEGO. They are intended to improve air tightness, ensure a better airflow and greater security. These filter fans are used in two highly-efficient cooling systems thanks to which it is possible to obtain a tailor-made combination. This is a more common solution that is aimed at blowing air from the outside. 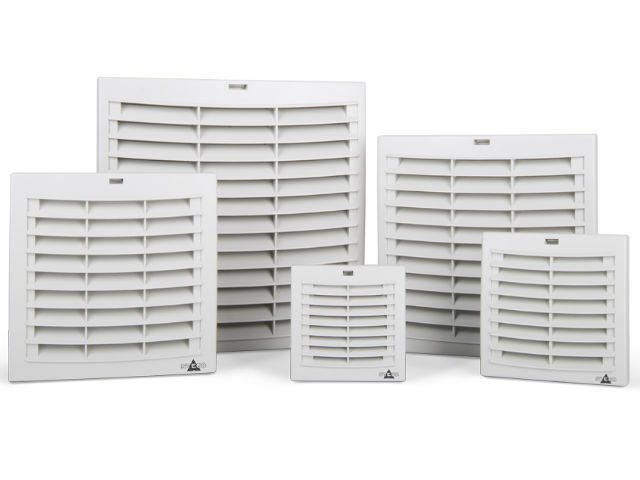 Fans with filters and filter mats are mounted in the lower part of enclosures. Cool air is pressed through a hole in the lower part of a cabinet and warm air is taken away through a ventilation grid placed in the upper part of the enclosure. Thanks to the use of new gravity flaps, which ensure efficient air exhaust, warm air is extracted from the enclosure more efficiently. If it is necessary to carry away the heat accumulated in the upper part of the enclosure, it is recommended to use a more efficient warm air evacuation system. For this purpose, filter fans with gravity flaps should be placed in the upper part of the enclosure. It will allow faster warm air evacuation from critical area. An air inlet grille with filter a mat should then be installed in the lower part of the enclosure in order to enable the supply of cooling air from the outside.